The 28″ Triumph 721- LT Programmable Hydraulic paper cutter handles many production challenges of digital, in-plant and on-demand printing. This machine includes a number of advanced features such as air jets to help with moving materials and optical sensors for safety and allow back gauge to automatically advance to the next cut. The EP keypad with digital display stores up to 99 programs of 99 steps each. The 721-LT also includes a number of important safety features that are part of the MBM SCS (Safety Cutting System) which includes: front safety light beams, a transparent safety cover on the rear table, a main switch, and a safety lock with a key along with many other safety features. The Triumph 721-LT has an optical cutting line that indicates the exact location of the cut and helps to perfectly position the trim marks and with the digital measurement readout you will get the perfect cut every time! The control module features repeat, cut, eject, and memory as well as a delete and insert mode for modifying program steps. The Triumph 721-LT can cut through a stack of paper that is up to 3 inches, which is equivalent to 500 sheets of paper, high quickly and easily! This machine can also cut paper that is up to 28 inches wide so you will be able to process both large and small sized documents. This machine is also very durable, however, since it is very large in size this machine is best for production type environments rather than offices. The hydraulically controlled clamp adjusts the pressure from 550 to 4400, which is the widest range of any Triumph cutter. This clamp allows the smooth processing of specialty stocks and the false clamp provides cushioning to the materials and is important during the handling of paper that is extremely sensitive to pressure and markings. If you have any questions or are interested in the Triumph 721-LT, visit us at SpiralBinding.com. 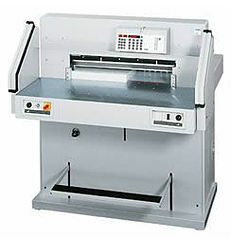 We have great pricing on a full line of Hydraulic Paper Cutters. Call us at 1-800-631-3572 for more information!